Team member giving is about supporting each other. It’s an opportunity to donate in effort to raise funds for your fellow team members, your neighbors and the individuals we treat. One drop can make a big ripple in the pond. Never underestimate the value of your donation and the help it provides. Sign up and donate by simply filling out the information in the form below to. There are several options that can make a big difference. Q. What does the North Memorial Health Foundation do? A. 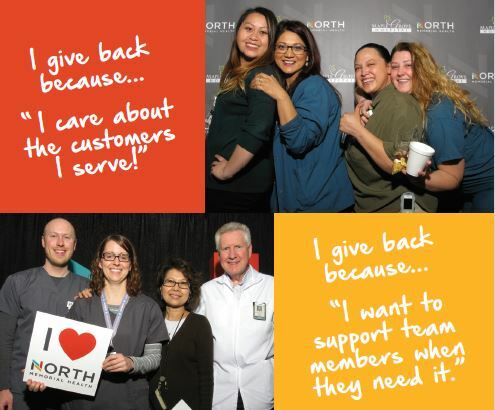 The North Memorial Health Foundation raises money for programs and services at North Memorial Health that wouldn’t exist without the generosity of donors. These programs support you, your family, friends, fellow team members and our community. A. Cash, check, credit card or payroll deduction. A. Your donation is automatically deducted from your paycheck each pay period to total the amount you pledged by the end of the year. Q. Can I customize the amount I donate per pay period? Q. Can I donate to multiple funds or programs? Yes. You just need to enter them individually as separate transactions. Q. I can only give a small amount. Will that make a difference? A. Any amount you give makes an impact – even $5 helps when combined with the donations of others. Q. Can I specify where my contributions should go?